November 2018 - "Lawford-Land, 2001, Show Invites, Marilyn, Beach Boys, BBC Radio and Endless Wave"
(29) Goodreads – A massive big thank you to “Erica Bailey” for her 5-star “it was amazing” review on the well-respected, world-wide book reading site. - While over on Amazon in Canada, the paperback version of Keith’s book on the actress stood at #15 in the “Most Wished For in Monroe, Marilyn” chart. (27) Chilly Berkshire – Another lengthy catch-up re work on the new, “alternate” movie project idea. (26) Freezing Berkshire – Phase 3 of the house renovations work was concluded… It took 6 days. (21) Berkshire / twinned with Midlands – Pre-production work on the new “rather alternate” new movie idea rumbled on when Keith had a rather nice, most informative phone call update with the film’s producer. (15) America – Berkshire – (via UPS) Keith received his copies of the new “Rocky” Pamplin, Beach Boys book, Endless Wave and wonderful it is too! “Been dipping into it again, and it really is a superb read.” The endorsement, top right, on the front cover looks ace as well! (13) Overcast Berkshire / Midlands – Another mighty (put the world to right) project catch-up with designer extraordinaire, Mr Paul S. "A number of projects for the New Year were discussed." (5) WWW – Keith reached the 450 connections mark on the worldwide business site, Linkedin. October 2018 - Beatles, Beach Boys, Queen, Circus '68 and a Rolls Royce! (30) Cold / Chilly Berkshire / twinned with the Midlands – The "rather alternate" movie project idea rumbled on… “and thankfully it still looks promising." (25) Not too bad / pretty mild London – Yet another trip into the City to meet (at 12:45pm) the property tycoon, entrepreneur and all round nice guy, Laurence Lameche. His recent ‘Imagine’ World Record attempt and a number of interesting, some rather funny business ideas (as well as Arsenal FC) were thrown around and discussed during the (hugely enjoyable) 5-hour conference. - Overcast Berkshire / Cold London – With lightning speed, interest in the paper about the Circus ’68 anniversary feature… seemingly and suddenly… bit the dust!! (18-19-22) Sunny / Overcast / Chilly Berkshire – With the 50th anniversary fast approaching, Keith moved up a gear on how to sell the remaining stock of Stones Circus ’68 books… On the Monday, following receipt of new presentation artwork for it, an approach was made to one leading UK paper. - Stocks of the paperback version of Marilyn were replenished on Amazon.com. (10) USA/ the World – Massive big thanks to “LilMrsScareAll” for her five-star “it was amazing” review of Marilyn on the Goodreads site. - A most wonderful replica of the Beatle’s 1967 psychedelic Rolls Royce stood on the road outside. Keith (naturally) had several pictures taken with it. (See photo page) So too did the Lennon look-a-like / sound-a-like, Jimmy Coburn (from the Cavern Club Beatles) who performed that night a most wonderful assortment of Lennon and Beatles numbers. (4) Overcast Berkshire – Keith had another in-depth, most interesting conversation with the film and record producer, Reynold D S.
(2) Overcast Berkshire – Time to move on the stock of Circus ’68 books. So contact was made with journalist, and Keith’s great friend, Robert M about a planned 50 years celebration article of the event in a leading UK paper. (1)Leafy Berkshire – Another monstrously busy day with (highly optimistic) discussions regarding the developing "alternate" movie project and the new Beatles-related film. September 2018 - Imagine, Marilyn, TOTP, RC and new Film Projects! (Till end of month) - Overcast Berkshire - Even more house renovations took place at Chez Badman…. (27) Dark Berkshire – Another trip to “Lawford-Land” loomed so advance train tickets were booked. The trip was set for early November. (22) Wet and windy Berkshire – Interesting update re the new Beatles-related movie idea. - Keith visited a rather nice, new-build property… Is this a new, highly exciting chapter in his life almost ready to begin, we wonder? - Keith had the great privilege of viewing, privately some rare, previously lost footage from a 1973 edition of BBCTV’s Top Of The Pops. “Quite simply, wow!” he said afterwards. (14 – Onwards (till completion) Overcast Berkshire – A long overdue text update of this site took place today. August 2018 - Marilyn, Beach Boys, Liverpool, Jones & a Curry! (30) Berkshire – BeatleWeek celebrations were officially over when the last of Keith’s American visitors, Bob B flew back to the States… and life returned, pretty much, thankfully, back to normal. (28) AM: Before jumping on his train home, Keith and great, long-time mate, Steve took a trip round to the Museum of Liverpool which was running Double Fantasy - John & Yoko, a free exhibition, "celebrating the meeting of two of the world’s most creative artists who expressed their deep and powerful love for one another through their art, music and film." Running until April 22, 2019 it truly is a "must see" for any true Beatles / Lennon fan. - Keith's goodbye to Liverpool (for this year, at least) was punctuated by a most pleasant phone from Jersey saying plans for the Beatles movie idea had just been given another big thumbs up! (22) Canada – In-between hospitality duties, a rather nice occurrence took place, the paperback version of Marilyn suddenly back to the #2 position in the “Most Wished For in Monroe, Marilyn” section on Amazon Canada. - Further great news reached Keith about the proposed "alternate" movie idea… more news soon! (21) Berkshire, UK – Entertaining Bob B from the US meant trips around Berkshire… and a rather nice curry in Windsor, next to the castle. (20) Canada – “Still hanging in there… six years on!” The paperback version of Marilyn was spotted in the #15 position in the “Best Sellers in Monroe, Marilyn” section on Amazon Canada. (15) Overcast Berkshire – Another lengthy catch-up with a chap who worked closely The Beatles at Apple for six years. - Another phone chat… with the news that the proposed "alternate" movie project idea was edging ever nearer to funding… but conversely the Jones film was moving ever closer towards failing. (13) – UK/ Europe - “And in the end…” the latest edition of Record Collector crashed thru the letter box of subscribers of the magazine and featured Keith’s piece on Kate Bush. It was to be, sadly his very last instalment of Rockin’ The Box… The long-running, ITV themed series had been axed! - Also looking slightly good… the proposed documentary on Monty Python. (10) Overcast Berkshire – Further files were sent to David, the editor, for the long mooted Brian Jones documentary. (9) Canada – “Well I never.” The paperback version of Marilyn suddenly raced back up to the #2 position in the “Best Sellers in Monroe, Marilyn” section on Amazon Canada. - The new "alternate" film idea edged ever closer to fruition. (7) Overcast Berkshire – Following a rather lengthy phone conversation, and after several months of work on it, it seemed as if the Jones film idea was now, regrettably dead in the water. (3 & 6) Sunny Berkshire – In an attempt to save the Brian Jones movie, Keith began searching, downloading and sending archive-related items of the late musician to Dave, the editor on the film. (1)-USA/ The World – another month, another top “it was amazing” rating of Marilyn on Goodreads, this time from Susan Gibson… Thank you very much indeed. July 2018 - Marilyn, 60s Pop, New Film?, Beatles Employee, Book Credit, House Renovations and...A Red Carpet Premiere! (31) USA/ the World – Another five-out-of-five Marilyn rating on Goodreads, this time from reader “Alexandra”… "Thank you, very much indeed." - France – on the same day, paperback copies of Marilyn sold out completely on Amazon in France. (24 – 25) Essex / London – Two days in the company of Keith’s friend, the investor, Peter from Jersey… Orpington on Tuesday, to visit the home of the legendary BBC Radio presenter, Brian Mathew’s son, Chris… and then on Wednesday, London for the UK "Red Carpet" Premiere of the utterly brilliant, comedy, horror flick, Fanged Up, in the company of friends, celebrities, and the stars of the film. - Keith was also in attendance at the after-show party, held at the nearby, exclusive club with some stars of the BBC drama series EastEnders in close proximity. 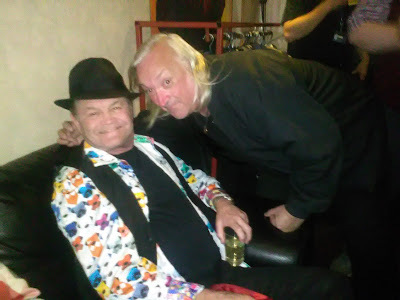 The producer of the movie, the legendary Terry Stone was also naturally present throughout the night, which ended around 5am…. (21 – 23) Super Sunny Berkshire / UK – The rather exciting Marilyn project moved up another gear with the arrival of a rather wonderful treatment for it… Close examination of it was required. - Also on the 23, the Kindle version of Keith’s work on the actress, suddenly found itself at #4 in the “Best Sellers in Monroe, Marilyn” section on Amazon Canada. - The video grabs, of Kate Bush’s 1993 appearance on LWT's Aspel & Company were finally sent over to Record Collector magazine. (18) Warm Berkshire – Work on the second phase of the renovation on Keith’s house came to an end… for now… It took a shade over three weeks! (17) Overcast Berkshire – Time for another Rockin’ The Box, this time Kate Bush’s 1993 appearance on ITV’s Aspel & Company. (27-29) Chez Badman – The extensive house renovations continued… “It's looking good." (29) Berkshire / Twinned with London and Derby - All was not lost... Ideas were afoot to salvage the Jones project. (25/ 26) Sunny Berkshire – Busy day of typing with further work on the Marilyn project and the latest edition of Rockin’ The Box for RC… this month, The Smiths’ filmed appearance on Channel 4's The Tube back in 1985. (21) Leafy (Sunny) Berkshire – Pre-production work finally began on the Marilyn project… creating the synopsis was (as in most major productions) the first major step. (20) USA – Happy Birthday to the legendary… Brian Wilson! (18) UK/ Europe – The latest edition of Record Collector, featuring Keith’s piece on Elton John's tour of America in 1975, crashed thru letterboxes across the land. (13) UK/ Berkshire – The Marilyn project moved in a new, rather exciting direction… and more work was needed. "It's getting there." (3) Super Sunny Berkshire – Keith (and his dear Mother) attended a truly wonderful 3pm barbeque in the grounds of Oxford House. "Thanks to all concerned for organising a truly superb afternoon, which also included a delightful performance by Pete the singer." (31) Sunny Berkshire – With excitement about the Marilyn project still ringing in his ears, Keith completed and sent in his latest Rockin' The Box piece; Elton John in 1975. - While over in Canada, Marilyn (paperback version) suddenly climbed up to the #4 position in the “Most Wished For in Monroe, Marilyn” listing on Amazon Canada. (30) South East, England – Big news, big news! – At last… preliminary stages of the rather exciting Marilyn project became altogether certain today. “So excited. Cannot emphasise that enough,” Keith gushed. - Windsor, Berkshire – A long overdue, afternoon, drinks and patisserie catch-up with another long-time pal, the famed photographer, Mike Randolph. - Canada – Marilyn’s still there! Keith’s book was seen at #17 and #30 (kindle and softback respectively) in the “Best Sellers in Monroe, Marilyn” charts on Amazon Canada. - Berkshire – Start of another RC Rockin’ The Box article, this month, Elton John’s October 1975 performance at Dodgers Stadium, as featured on the LWT show, Russell Harty. (26) Canada – Amazing! Keith’s Marilyn was to be found at #7 and #18 (kindle and softback respectively) in the “Best Sellers In Monroe, Marilyn” section on Amazon Canada. - Almighty catch-up with long-time mate, Mike D.
(22) Sunny Berkshire – More discussions (via phone) took place today about the proposed John Lennon and Brian Jones movie ideas. - More work / deliveries on/ for the Chez Badman renovations. (21) Berkshire twinned with Canada – On the day Keith emptied a great part of his house, his Marilyn suddenly climbed back to the #2 position in the “Best Sellers in Monroe, Marilyn” section on Amazon Canada. (5) Langley, Berkshire – Keith attended the birthday celebrations for another long-time friend, Dave C.
(3) Sunny… yet chilly Berkshire – More Marilyn-project related discussions overtook most of the day. (2) Sunny Berkshire - A day of carpet lifting… and Brian Jones project discussions. What a combination. (30) Berkshire – The month wrapped with another Rockin’ The Box piece for Record Collector magazine, this time, Abba members, Agnetha and Ani-Frid’s New Year’s Day 1983 appearance on ITV’s Razzmatazz. (25– 26) Berkshire twinned with London – Two more days of exciting, yet frantic activity regarding the Marilyn project… “We’re at the equivalent of fence 30 in The Grand National now,” Keith remarked. - The Brian Jones movie idea once more reared its head… with more ideas being put forward. - With Keith’s long-running RC series, Rockin’ The Box about to come to a natural end, discussions about its replacement were held this afternoon with the mag. (21) UK/ Europe – The latest edition of Record Collector, featuring Keith’s piece on Mick Jagger’s legendary, 1967 appearance on Granada’s World In Action, crashed thru the letter boxes of subscribers throughout the UK and Europe. (20, 21 – 23) Berkshire twinned with London – Three days of frantic activity regarding the Marilyn book-to-film project. Emails, text and phone calls a-plenty went on. (19) Sunny Slough – Besides chasing up invoices, another rather exciting Queen project was started. - The “book-to-film” Marilyn project was given another shake-up today. - The paperback version of the great actress was seen today in the #20 position in the “Most Wished For in Monroe, Marilyn” section on (the much improved) Amazon Canada. (18) Sunny (and rather warm) Slough – Another highly-enjoyable catch-up with the legendary comedy producer, Simon L. A number of most interesting projects were naturally discussed. - Marilyn (paperback version) made a sudden jump to the #26 position in the “Best Sellers in Monroe, Marilyn” section on the (new look) Amazon Canada. (14) Aintree twinned with World – Another exciting Grand National, the world's great horse race. Keith backed the winner, Tiger Roll. Easily one of the most exciting days in the sporting calendar. - Catch-up with Alan G. and Reg P. about the many, ongoing film project ideas. (9 - 13) Overcast Berkshire– intermittent thru week – Keith continued with his house renovations. (4) Goodreads – Many thanks to “Stuart Stone” for his five-star “it was amazing” rating of Marilyn on the well-respected book reading site. (3) Overcast, Cold Berkshire – With Easter over, it was a return to my (wonderful) laptop for an almighty email / work catch-up. (29) Overcast, Rather Cold Berkshire – At last, after a delay of eight months, this website finally received a major text update, with entries for August to November 2017 being added. - Another lengthy, most interesting project catch-up with financier, Peter from Jersey. (27 – 28) Sunny, but Cold Berkshire – Further frantic work on the Brian Jones documentary project. More potential financiers were furnished with the production info they required. - Family matters (on the 28th) were top of the agenda today and an evening meeting was attended to. - Lengthy conversation (on the 27th) about the Brian Jones project with the idea’s co-owner, Reg. (22) Overcast Berkshire – A terrifically busy day spent typing emails and texts, taking/making phone calls, and downloading WeTransfer files for the proposed Brian Jones project. (21) Sunny Slough (twinned with the Midlands) – Update conversations on the two proposed movie projects and… it looked promising. More news soon! - Brief bit of archive research on the upcoming Beatles film which focused on their early years. (19) Sunny, but cold Berkshire – Day of emails, project catch-ups and a hook-up with old friend, Gary S.
(18) Snowy Berkshire – Seven months after his return to the concert stage, Keith received a most pleasant surprise… to play drums with an "about to reform" local band. (13) Central London – A 1pm meeting at “The Office” with Alan G, Terry Tel Rawlings and Paul McEvoy to discuss the recently rejuvenated Brian Jones movie project. (12) Chilly Berkshire – A busy day sorting future Record Collector articles and typing outstanding invoices. - A sad loss, legendary comedian, Ken Dodd passed away. (9) Still chilly Berkshire – Great news was received about the Marilyn book to movie idea. (5-8) South Coast – Another (slightly relaxing) trip down to Lawford-Land… the summer season beckoned, and there was lots of work to do. (2) Goodreads – Many thanks to “Katrine Maxwell” for her top “it was amazing” five-star rating of Marilyn on the top book-reading site. (1) Another freezing cold, and snowy day in Berkshire – Various commitments / errands were sorted today including the sorting of a new storage facility. - Out of the blue, following a conversation with producer, Alexa Morris, it looked like a new movie idea was about to get the “green light.” Watch this space! (27-28) Snowy, slippery, freezing Berkshire – That time again, another Rockin’ the Box article for Record Collector magazine. This month, Mick Jagger’s legendary, 1967 appearance on Granada ITV’s World In Action. -Invoices were prepared/ paperwork tidied. (23 – 26) Cold Berkshire – Archive film research on the new “Bullion” movie project was completed. - Still there. Marilyn (paperback version) was spotted in the #6 position in the “Most Wished For in Monroe, Marilyn” section on Amazon Canada. (19) Chilly Berkshire - The first proper day of archive research on the new Lennon project. - While a meeting was taking place in London, Keith confirmed the first interviewee for the new film. - Loose ends... Tidying up of business on the Rock n Roll Circus book project. (17) Cold Berkshire – Further great news when it was revealed (in a phone call this afternoon) the new John Lennon movie documentary has been given the go-ahead…. Now the hard work begins. (15/16) Freezing Berkshire – Further research work on the new “Bullion” robbery movie. (8) Wandsworth, South West London – A trip out to see Alan G and producer, Alexis to discuss the ongoing new movie ideas. (7) Freezing Berkshire – Early, pre-production work continued on two projects, most notably the one on John Lennon. (6) Windsor, Berks – Another almighty catch-up with the legendary 60s/70s photographer, Mike Randolph. - The new Lennon project continues to move along nicely towards being given the go-ahead. (5) Cold Berkshire / London – A rather exciting new TV show idea was submitted to Channel 5 in London. "Fingers crossed." - A discussion with director, Alan G. A meeting was arranged for this coming Thursday (the eighth). (2) Cold Berkshire – Busy day of emails and phone calls, discussing various, highly exciting new projects and the update of… Marilyn. (1) Still cold Berkshire – A most frustrating discussion with Royal Mail… the letter (send the third week of December) still has not arrived, same for a complaints form about it… "Disgusting!" (31) Freezing Berkshire –Archive research work on a new movie project, set in the early 1980s. (27) UK – The latest edition of Record Collector, featuring Keith’s McCartney / Pink Floyd 1967 piece crashed thru the letter boxes of subscribers across the country. (22) Freezing Berkshire – Conclusion of the Laurel & Hardy text re-write. - Marilyn (paperback edition) was seen at #3 in the “Most Wished For In Monroe, Marilyn” section on Amazon Canada. (19) Marilyn still doing well… Many thanks to “Nova Ferguson” for her five-star “it was amazing” review on the Goodreads site. (15/ 17/19) Freezing Berkshire – Three days proof-reading of a new, rather exciting Laurel & Hardy script. (19) – Canada – Still hanging in there… A wonderful surprise when the softback edition of Keith’s Marilyn suddenly climbed to #3 in the “Most Wishes for in Monroe, Marilyn” section of Amazon Canada. (18) Freezing Berkshire – Loads of film / TV projects discussed. One in particular, looks like starting at the end of February. Fingers crossed. (15) USA – Sad death of Paul Goresh… the photographer who befriended his hero, John Lennon and took that infamous photo of Lennon with… RIP, Paul and thanks. - The results of the two-day, Rod Gods research was typed and sent over to QPL. (9) Leafy Cold Berkshire – second day of Rock Gods research. - Big news when it was revealed (to those concerned) that, with funding almost in place, the go-ahead on another of the ongoing, rather exciting projects was pretty much guaranteed. Filming of it is set to begin in March. - Marilyn (kindle edition) suddenly returned to the #3 position in the “Most Wished For in Monroe, Marilyn” section on Amazon Canada. - Another RC… this time the March 1967 Granada TV programme, So Far Out It’s Straight Down featuring (amongst others) Pink Floyd and Paul McCartney. (8) Leafy Berkshire / UK – Colleagues of Keith’s returned to work and our Mr Badman began the year by researching a new project featuring The Rock Gods! (5) Sunny Berkshire – Back on emails and the contacts list of Keith’s Linkedin account suddenly exceeded the 403 mark! - Amazon Canada. The paperback version of Marilyn suddenly climbed to the #12 position in the “Best Sellers in Monroe, Marilyn” section of the site. (3) Berkshire – Keith’s lengthy, Christmas / New Year concluded with a catch-up with his old mate of over thirty years, Mike D.
- The afternoon was spent doing some preliminary research on a new Queen-related project. (1) UK/ Europe – A cracking start to the year when BBC Four repeated the superb Queen rockumentary, Rock The World at 10pm this evening. December 2017 - Being social, new projects, Beatles, Marilyn... and everywhere it's Christmas! … The end of another splendid year… Here's to a happy & prosperous 2018! (30) Berkshire – Aside from New Year's Eve, time for the last social catch-up of the year, this occasion with another of Keith's old, long-time mates, Gary S.
(28) Berkshire – Another social get-together, this time with another, top, long-time friend, Spencer. - One of the "Get This" department. Keith received an email from the legendary DJ and television personality, David Hamilton. (25) Berkshire – The big day arrived, Christmas Day, which was spent helping out in the Care Home and in the company of Keith’s dear, most treasured Mother, Kathleen. "A most memorable, truly joyous day was had by all... most importantly by my dear Mum." (23) Maidenhead – Annual Festive get together of Keith’s Berkshire gang. (21) Angel, Outer London – A Christmas catch-up with leading property magnate, Laurence. (20) Berkshire - Yet another big breakthrough took place on the long-mooted Marilyn project. (19) Windsor, Berkshire – A catch-up with another of his good, long-time pals, Daniel J. (15) Eton, Berkshire – Keith's 2017 Christmas tour began with a Christmas catch-up with the legendary, 60s/70s snapper, Mike Randolph. (12) Berkshire – Another, long overdue catch-up with the legendary Queen and comedy producer, Simon. Once more, a number of rather interesting, future projects were discussed. - While over on Goodreads, Marilyn received yet another five-star rating, this time from “Larissa Oliveira Ribeiro”. Many thanks! (8) Central London – meeting about the new, proposed John Lennon documentary with director, Alan G and potential investor, Tony. (5) Slough – Birthday Eve, amazing news about “the” Marilyn project reached Keith. (4) Berkshire – A forward was compiled and typed for friend, Laurence's new book on the booming property market. (2) US / the World - Many thanks to “Luísa” for her five-star “It was amazing” review of Marilyn on the well-respected, Goodreads site. - Slough – The 2017 Birthday Tour continued tonight, with a catch-up with old, long-time friend, Spencer. (1) Central London, Paddington - Meeting with Jersey's top man, Peter O’Brien and his family. A number of rather interesting, movie-related projects were discussed. "Great seeing him again... after so many years." November 2017 - Kenney Jones, Carnaby Street, Matt B, RC, Marilyn and Queen! (23/24) Cold Berkshire / the North – Updates on this site took place today, notably the pictures of Kenney Jones (from two days earlier)…see pic section. - Plans for next week, business-wise were also formulated today. (23) Cold, overcast Berkshire – Several chats about several, forthcoming TV/ movie projects were discussed today… over the obligatory mobiles. (22) Carnaby Street, London – Keith attended a rather impressive event in world famous Carnaby Street; a statue celebrating the legendary, Lord John. Doing the honours, none other than the classic ex-Small Face/ Faces drummer, Kenney Jones. Other notables present today, legendary 60s columnist/ publicist, Keith Altham and the superb TV comedian, Matt Berry. “Great talking to you both,” Keith said. (16/17) Overcast Berkshire – A Punk-related documentary was quickly started… and swiftly shelved... within two short days. (13) Berkshire – Another RC Rockin’ was started, this month, George Harrison and Ringo Starr’s 1988 appearance on LWT’s Aspel & Co.
(11) UK / Europe – The latest Record Collector crashed through letter boxes of subscribers across the land and featured Keith’s piece on Wings’ 1979 appearance on Tyne-Tees’s Saturday Shake-Up. (6-9) South Coast – Another business-related trip out to “Lawford-Land” and most enjoyable it was too. (3) UK / (9pm UK TV time) European premiere of Queen: Rock The World. (Repeated later at 1am.) “A most memorable viewing of that inaugural screening took place for me that night,” Keith announced. (2/3) Cold Berkshire – Video grabs of the latest Rockin’ The Box for Record Collector were prepared and sent over. October 2017 - Beatles, Marilyn, JFK and Queen! (29) USA – A big thank you to “debby harmon” for her 5 out of 5 stars rating of Marilyn (hardback version) on Amazon.com. (26) USA – The National Archives release 2,800 previously classified files relating to the assassination of President, John F. Kennedy. To say Keith was all over them like bees over honey, was putting it rather mildly… “The story about an anonymous call to a newspaper in Cambridge saying ‘Something’s going to happen’ 25-minutes BEFORE Kennedy was shot, was particularly interesting… and enthralling,” he remarked. (25) Sunny Berkshire – More preliminary archive research on the new, rather exciting movie project. (23) Canada – Another incredible day when (three YEARS after its release) the paperback edition of Marilyn raced back to the No.1 position (yes NUMBER ONE) in two different charts on Amazon Canada… “Best Sellers in Monroe, Marilyn” and “Most Wished For in Monroe, Marilyn” listings… Incredible! - Further preliminary research work on the new, rather exciting movie project. (18) Wet/ Rainy Berkshire – More early, pre-production work on a new, rather exciting film/ documentary project. (16) Wandsworth – A trip out to see director, Alan G. to discuss the new, various ongoing projects. (14) Subscribers – The Pepper movie, It Was Fifty Years Ago Today... began its two-month run on one of the world’s biggest the movie subscribers channel, Netflix. (10) Wigan – A trip up North to see one of the World’s biggest Beatles dealers; Paul Wane at Tracks to see his truly amazing collection of pictures. - Further, rather early, formative work on the new Lennon film/ drama idea also took place today. (7) USA – Many thanks to “Samantha Dee” for her 5-star rating of Marilyn on the Goodreads website… “It was amazing,” she said… Thank you! September 2017 - Building work, Marilyn, Pepper and the Rock Gods, Queen! (29) Overcast Berkshire – Archive work resumed on the new official, Queen documentary, a show celebrating the big fortieth anniversary of their superb, 1977 album, News of the World. (28) Windsor, Berkshire – Catch-up with another of Keith’s old chums, Daniel J. out in Royal Windsor. - A great conversation with producer, Simon L… the “Book-to-Film” Marilyn idea was progressing very nicely. (23) Dry, but overcast Berkshire – The start of a five-date tour of catch-ups with some old friends, beginning tonight with one of the country’s top record/ Beatles dealers, Steve Holmes. The venue, Langley, in Berkshire. It was their first social, non-Beatles related hook-up in over… a quarter of a century! (13) Sunny Berkshire – Work on the latest Rockin’ The Box article for Record Collector magazine was completed this morning. This time under the spotlight, John Lennon’s appearance on the December 1969 ATV/ITV special, Man of the Decade. (11) Sunny Berkshire – Work began on the latest instalment of Rockin’ The Box. (10) UK – A major photo update took place on this site, particularly the images of Keith on drums at the Liverpool Convention just two weeks earlier. (9) UK/ Europe – Latest edition of Record Collector was released and included Keith’s recent Rockin’ The Box article on The Yardbirds on Granada TV in 1964. The piece even warranted a “Yardbirds On TV” mention on the mag’s front cover! (8) USA – The Pepper-influenced movie, It Was Fifty Years Ago Today… was officially released on DVD and Blu-ray in the world’s biggest territory and most influential territory… America. (7) UK / America etc. – The third part (featuring the second part of Keith’s recent interview about Marilyn) was sent out to the radio stations in America (New York, Texas and Illinois) and Australia. The broadcasts of which, will go out tomorrow (September 8); stations/ timings as before. (6) UK – Another major update took place on this site, particularly the photos section. (1)Goodreads – Another five-star review of Marilyn (the Italian version, Gli ultimi giorni di Marilyn Monroe) on the top-rated book-reading website, this time from “Giovanna”. August 2017 - US radio, Pepper film, Liverpool... and a return to the concert stage! (30) America – The following US radio stations, BNNS Internet Radio (in Illinois), the Diversity Broadcasting Network (in New York), the TMV Cafe (San Antonio), the Pyramid One Network and White Light Infinity Radio all received their copies of the second part of the Marilyn 3-part special (Keith’s first part) ready for transmission the following day. Diversity Broadcasting Network aired on Thursday (August 31) at midnight and was also available on the station’s “play on demand” service. TMV Café broadcast the programme at 2am on Friday morning (UK time). (27 - 31) Liverpool Beatles Convention – Keith's 31st video show. Early versions of the Cavern book were on display and Keith even shook hands with the legendary US radio DJ, reporter, Larry Kane. - Great opportunity also for Keith to catch-up with so many if his close friends. (25) Canada – In the “Top Sellers in Monroe, Marilyn” section on Amazon Canada, the paperback version of Marilyn stood while the kindle edition was placed three places hi8gher at number 15. (22 - 23) Sunny Berkshire – In readiness for the Liverpool concert, today saw the start of the great UK invasion of some of Keith’s American friends. (17) Overcast Berkshire / twinned with London – Further pre-production (albeit brief) work on the Mexico ’70 movie idea. (16) UK – Exciting news! The Marilyn “Book-to-TV” drama idea edged along a little but further. (14) US – The famous Marilyn photographer, Douglas Kirkland sent Keith a message via Linkedin. - US Radio interview – New York, Illinois, Dallas and Australia. Due to it carrying on far longer than anticipated, Keith was invited to appear in another part of the Marilyn special, the taping of which was scheduled to place the following Monday, August 21 (to be broadcast September 7). (7) UK – Thanks also to “Garth” for his five-star review of Marilyn (kindle edition), this time on Amazon in the UK. “This Is a Very Good Book,” he wrote, “Well worth the Buy.” Nice! - In readiness for the proper US radio taping session next week, Keith partook in an afternoon audio testing session with Diane (in the UK) and Norm (over in the States). The subject? The 55th anniversary since Marilyn sadly passed away. (5) Goodreads – Many thanks to “Middlethought” for their five-star review of Marilyn on the renowned book reading site. (3) Camden, London – Keith had a most enjoyable lunch with Reynold D’Silva and Pete Compton of Silva Screen. Naturally, much was discussed, including how well their Pepper, It Was Fifty Years Ago Today… film had done.